THE queue snaked along outside the Bristol Hippodrome, towards Colston Tower, and all the way back past the theatre out on to College Green. But the hundreds of children standing patiently in line were not waiting for the doors to open on the theatre's latest show. Instead they were waiting for their chance to audition to appear on the famed Bristol stage. Some young performers waited outside the Bristol Hippodrome for more than two hours yesterday for their chance to show off their talent in an attempt to win a part in a production of Fame at the theatre. More than 1,000 young hopefuls took the opportunity to audition yesterday for the show that will appear in the city for one night only in July. Some brought chairs, others brought packed lunches and everyone stood in the sunshine gripping their completed entry forms ready to gain an audition slot. Once through the doors the youngsters were handed a number along with audition material to practise before being called through in batches. The excited groups were then ushered upstairs into side rooms where they completed vocal warm- ups prior to their turn in the spotlight. Among the first through to the warm-up stage was Imogen Carter, ten, of Whitchurch, who attends Whitchurch Primary School. She said: "I arrived at 9am and I was fifth in the queue. "It is the first time I have ever auditioned and I'm really excited. "I would be really proud of myself and happy if I was picked." Big Act director Martin Williams, 29, said he was searching for 150 people aged eight to 20 years old to star in the new version of Fame. And more youngsters will have the chance to audition for a role in the production today after a second round of auditions was announced. Mr Williams said: "I knew it was going to be a great turnout but this is absolutely fantastic. It is such a brilliant turnout we have decided to hold an extra audition day to give other youngsters who could not make it to the audition a chance. 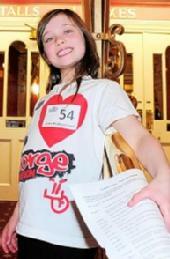 "We are casting for 150 young people and they will be playing the principal roles in the show. Those chosen will next meet two days before the show and they will get 48 hours to rehearse everything." The performance will be held on July 4, at 7.30pm, in aid of the Sue Ryder charity. "This is the fourth time we have done a show", Mr Williams said. "Usually we adapt books into musicals but this is the first time we have staged a West End musical." Among those eager to impress the judges at auditions and star in the spotlight was Ellie Robilliard, 11, of Wells, who said: "I have never auditioned before and it would change my life if I was picked – it would be a new start." The show follows on from the success of previous productions The Jungle Book, Alice In Wonderland and The Lion, The Witch and The Wardrobe. Following a group of students from auditions to graduation, Fame takes audiences through the highs, lows, friendships, romances and sheer hard work that is daily life for the star-struck pupils in their quest for success. Jasmine Dorgan, 13, of Congresbury, who was with a group of fellow Churchill School pupils, said: "I love dancing as I am a member of Step in Time, The Angela Robbins School of Dance in Hewish. "We have to go in there today and act and sing and dance. "It would be amazing if I was picked today out of all these people." Waycroft Primary pupil Allegra Allen, nine, of Hengrove, who queued for more than two hours, said: "It would mean a lot to me if I was picked. "I do a lot of dancing and acting and I play instruments so it would be nice to get a part in the play, especially if it is for charity. "When I grow up I either want to be an actress or an author, maybe writing plays." For more information on the show visit www.thebigact.com.